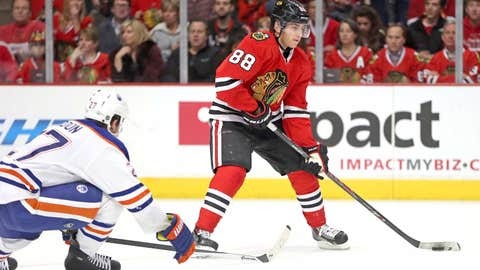 Patrick Kane's pass that scored for the Oilers didn't cost the Blackhawks a win. Patrick Kane is so good at scoring goals, he’s now scoring them for opposing teams. With the Chicago Blackhawks already on the power play midway through the second period on Sunday, Edmonton Oilers goalie Devan Dubnyk slashed Andrew Shaw. With the delayed penalty signaled, the Hawks pulled goalie Antti Raanta for the two-man advantage. The optimistic situation turned bleak fast, however, when Kane threw a pass off the boards in the hopes of reaching a teammate at the point. Instead, nobody was at the point, and Kane’s dish bounced off the boards and ricocheted into the empty Chicago net to give the Oilers their easiest goal of the season to tie the game at two apiece. Despite being on the bench when the puck went in, Boyd Gordon was credited for the goal. Luckily for Kane, his unfortunate bounce didn’t haunt the reigning Stanley Cup champs as the Hawks went on to win 5-3. Check out the bizarre play in the video below (about 16 seconds in).